A strong yet delicate bright yellow sassy sunflower stands against a vibrant blue background. Original mixed-media painting by Mary Anne Hjelmfelt. 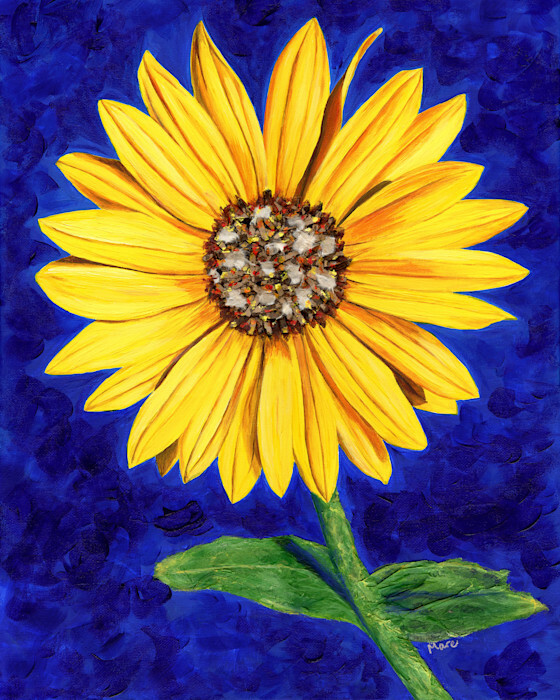 Original mixed media painting (acrylic paint, tissue paper, fine art papers and cardboard) of a bright yellow sunflower on a deep blue background. This happy sunflower took on it's own personality once I started painting. The seedheads needed to be 3D, so I shredded some packing paper to represent the crunchy parts, and tore some soft art papers to keep the delicacy in it's form. Then some acrylic paint touches tied it together with the flowing petals. More papers, paint and some pastel created the fluffy character of the leaves. The contrasting deep blue brushstrokes in the background is an enhanced version of the lovely blue sky that surrounded it. This happy sunflower took on it's own personality once I started painting. The seedheads needed to be 3D, so I shredded some packing paper to represent the crunchy parts, and tore some soft art papers to keep the delicacy in it's form. Then some acrylic paint touches tied it together with the flowing petals. More papers, paint and some pastel created the fluffy character of the leaves. The contrasting blue brushstrokes in the background is an enhanced version of the lovely blue sky that surrounded it.